With the first twinge of a sore throat or the first ache of a cold, I can hear my dad’s voice…”Take some Vitamin C and Zinc!” It’s how to fight off the common cold! I don’t quite know where he and my mom acquired this home remedy idea from, but the fact of the matter is…it works! 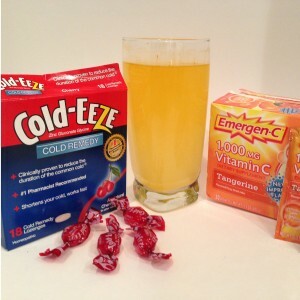 We use Cold Eeze Zinc Lozenges and Emergen-C Dietary Supplement Drink Mix. There is a trick here though, you have to catch the cold early! Taking your Zinc and Vitamin C religously (at least 2-3 times a day) with the onset of the first cold symptom helps reduce these colds symptoms and keeps you from getting sick! The hubby and I just went to the store and stocked up on Cold Eeze and Emergen-C. We will be damned if we catch these colds!